Ready to relax and recharge after an event-filled day in the Florida Keys? Baker’s Cay Key Largo, Curio Collection by Hilton, offers plenty of creative options to pamper your palate and tantalize your taste buds. Every room and suite at Baker’s Cay Resort Key Largo, Curio Collection by Hilton surrounds you with soothing comfort – a personal oasis with thoughtful amenities for a relaxing island getaway. Relax in a spacious, sun-filled guest room and breathe in the tropical breeze on your private balcony. Contemporary amenities include complimentary WiFi, a 50-inch HDTV, premium HD cable, a mini-refrigerator, coffeemaker, closets with drawer space, ample connectivity for all your devices, and locally sourced bath products. Nestled in Key Largo, the northernmost island of the Florida Keys, the Baker’s Cay Resort Key Largo is minutes from a variety of tropical activities and water adventures. Make the most of the gorgeous weather exploring the restaurants, shops, scenic nature trails and state parks in the area – and of course the numerous opportunities for fishing, parasailing, snorkeling, scuba diving, swimming with dolphins, and glass-bottom boat tours. Not sure where to start or looking for a hidden gem? 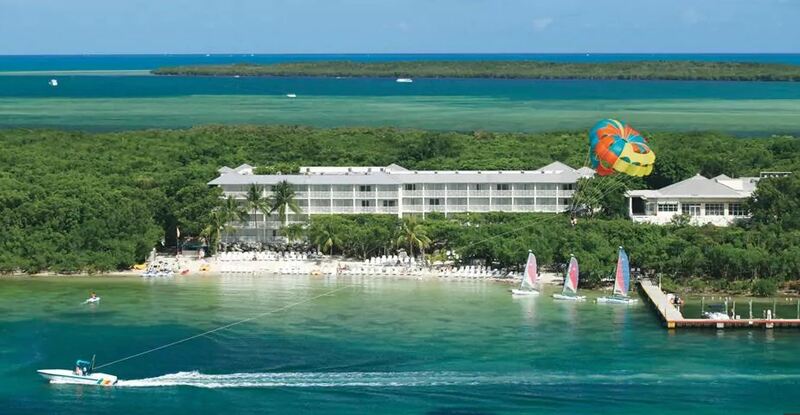 Our resort staff are happy to recommend things to do in Key Largo during your getaway. Meetings and special events at Baker’s Cay Resort Key Largo, Curio Collection by Hilton are planned with meticulous care and efficiency. Bordered by picturesque Florida Bay and the Gulf of Mexico, Baker’s Cay Resort Key Largo is a captivating spot for Florida meetings and weddings. Our flexible Key Largo wedding, meeting and event venues provide services and amenities to guarantee a highly successful endeavor. From board meetings to extravagant banquets, our award-winning staff will fulfill your expectations with responsiveness and attention to detail. From corporate meetings, executive retreats, to educational seminars, we offer a variety of venues to fit your needs. Exhibitors and meeting planners utilize our venue for a range of events. Enjoy over 17,000 sq. ft. of versatile space and breathtaking ocean view rooms. Elevate your next small Key Largo meeting to the next level with exemplary personalized attention at Baker’s Cay Resort Key Largo, Curio Collection by Hilton. Our Key Largo meeting venue provides access to a full-service business center and modern A/V equipment. Stay connected with WiFi access available throughout business and public spaces at our Key Largo event space. Located less than an hour from Miami Airport, Baker’s Cay Resort Key Largo, Curio Collection by Hilton is a great event venue for your next conference or large event. With over 15,000 sq. ft. of flexible exhibition and reception space, the hotel’s facilities are easily customized. Let our experienced Meeting and Event Team handle the details, ensuring a seamless conference, seminar or special event.